Their love for each other is so pure and simple; it goes beyond size and species. Both animals have managed to successfully survive their rough beginnings. But even more than that, they each seem so happy to have found a friend. “Another box of kittens dumped over the fence, Dave” one of our volunteers greeted me one summer morning. I groaned inside. As the founder of Wildlife Images Rehabilitation Center, I had more than enough to do to keep up with the wild animals in our care. But somehow, local people who didn’t have the heart to take their unwanted kittens to the pound often dumped them over our fence. They knew we’d try to live-trap them, spay or neuter them, and place them thought our network of approximately 100 volunteers. That day’s brood contained four kittens. We managed to trap three of them, but somehow one little rascal got away. In twenty-four acres of park, there wasn’t much we could do once the kitten disappeared—and many other animals required our attention. It wasn’t long before I forgot completely about the lost kitten as I went about my daily routine. A week or so later, I was spending time with one of my favorite “guests”— a giant grizzly bear named Griz. This grizzly bear had come to us as an orphaned cub six years ago, after being struck by a train in Montana. He’d been rescued by a Blackfoot Indian, had lain unconscious for six days in a Montana hospital’s intensive care unit, and ended up with neurological damage and a blind right eye. As he recovered, it was clear he was too habituated to humans and too mentally impaired to go back to the wild, so he came to live with us as a permanent resident. Grizzly bears are not generally social creatures. Except for when they mate or raise cubs, they’re loners. But this grizzly liked people. I enjoyed spending time with Griz, giving him personal attention on a regular basis. Even this required care, since a 560-pound creature could do a lot of damage to a human unintentionally. That July afternoon, I approached his cage for our daily visit. He’d just been served his normal meal—a mix of vegetables, fruit, dog kibble, fish and chicken. Griz was lying down with the bucket between his forepaws, eating, when I noticed a little spot of orange coming out of the blackberry brambles inside the grizzly’s pen. It was the missing kitten. Now probably six weeks old, it couldn’t have weighed more than ten ounces at most. Normally, I would have been concerned that the poor little thing was going to starve to death. But this kitten had taken a serious wrong turn and might not even last that long. What should I do? I was afraid that if I ran into the pen to try to rescue it, the kitten would panic and run straight for Griz. So I just stood back and watched, praying that it wouldn’t get too close to the huge grizzly. The little cat pounced on it and carried it quickly into the bushes to eat. I breathed a sigh of relief. That cat was one lucky animal! He’d approached the one bear of the sixteen we housed that would tolerate him—and the one in a million who’d share lunch. These days, Cat eats with Griz all the time. He rubs up against the bear, bats him on the nose, ambushes him, even sleeps with him. And although Griz is a gentle bear, a bear’s gentleness is not all that gentle. 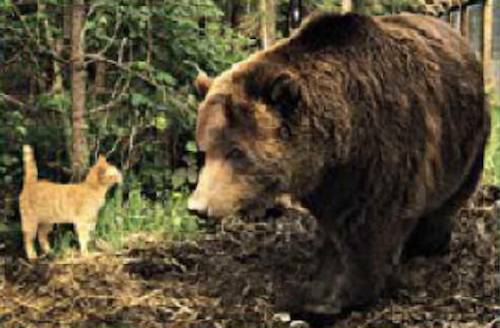 Once Griz accidentally stepped on Cat. He looked horrified when he realized what he’s done. And sometimes when Griz tries to pick up Cat by the scruff of the cat’s neck, he winds up grabbing Cat’s whole head. But Cat doesn’t seem to mind.